Anna Pearce blogs for Cloud Dance Festival and in her latest post she discusses how art can make learning easier. We were really flattered to find out that she used Meeting Place as one of her examples (alongside DV8’s Can We Talk About this? and War Horse). Thanks Anna! Another subject I was never particularly enthralled with in my younger years was Maths. I can’t say that much has changed since then, although watching Hamish McPherson and Martine Painter’s ‘Meeting Place’ at Resolution! 2012 encouraged me to take a tentative step towards finding an interest in numbers and scientific patterns. Hamish and Martine play with visually unfolding an algorithmic formula: a series of instructions, a mathematical way of describing a sequence, used in computing, the stock market and other such seemingly alien contexts. However, seeing these things embodied on a stage made me interested, and encouraged me to think on something I’d never have considered relevant to my life. And of course it is: this laptop is using algorithms as I type, and yours as you read. The post touches on an interesting issues and would be well worth a read even if we weren’t mentioned! Meeting Place was covered by Culture Lab, the section of New Scientist where ‘books, art and science collide’. Mathematics and dance seem to be unlikely bedfellows, yet Hamish MacPherson and Martine Painter’s duet has found a Meeting Place for the two. The piece reflected a thoroughly considered approach, building up a number of simple movements in a formulaic way. In spite of the seemingly rigid structure it is based on, Meeting Place had a certain refreshing, unrehearsed quality. The choreographers-turned-performers were delightfully unpredictable as they engaged in playful dialogue with each other, boldly sustaining moments of stillness and amplifying the humour in the occasional and apparently coincidental moments with their deadpan faces and absolute conviction. An algorithmic formula is behind Hamish MacPherson and Martine Painter’s Meeting Place. You know, algorithms, like the complex formulae that investment banks’ computers use to drive us into financial meltdown. This one, however, has a far more benign and entertaining purpose, and results in a moderately charming game of repetition, accumulation and amusing absurdity. As a pair of performers, MacPherson and Painter have a nice connection and they string together simple units of movement – an arm swing, a raised leg, a vocal yelp – in a manner that manages to keep our attention for almost the full twenty minutes. Some genuine laughs out loud and a nice visible logic at play. 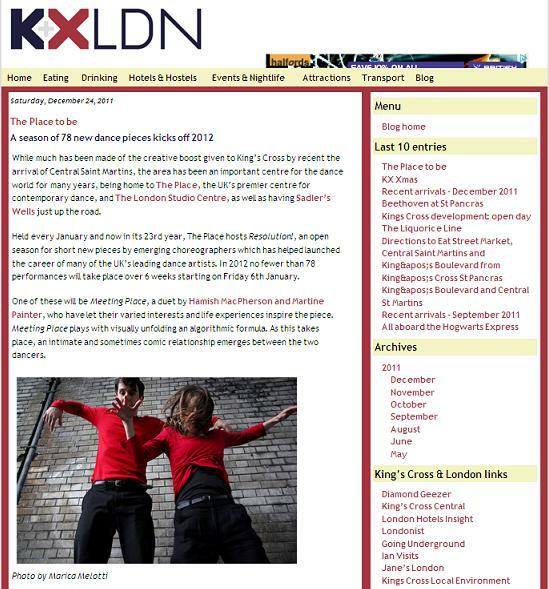 KXLDN is the new online guide to the King’s Cross St Pancras area of London. Covering hotels, cafes, pubs, bars, restaurants and events within a 10 minute walk of King’s Cross and St Pancras stations. We’re really pleased by their coverage of Meeting Place and Resolution! 2012.